Help foster your kid’s penchant for dress up play by inspiring a royally good time with these sweet felt Little Red Caboose Crowns. Your little prince or princess can choose to rule with flower, mushroom, leaf or squirrel wooden buttons. Each topper is handmade in Canada and one-of-a-kind. They’re also fun for designating the reign of a birthday boy or girl for a day. 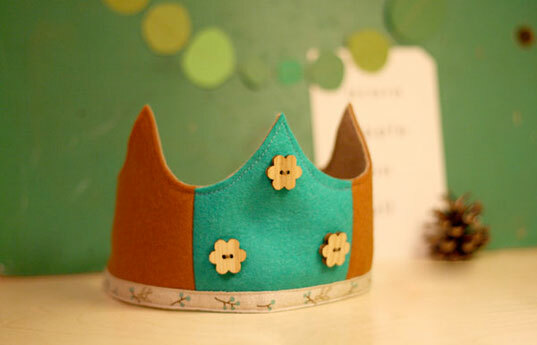 Help foster your kid's penchant for dress up play by inspiring a royally good time with these sweet felt Little Red Caboose Crowns. Your little prince or princess can choose to rule with flower, mushroom, leaf or squirrel wooden buttons. Each topper is handmade in Canada and one-of-a-kind. They're also fun for designating the reign of a birthday boy or girl for a day.